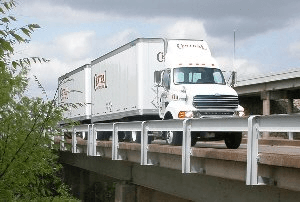 Freight Rate Central is a shipping logistics company that serves businesses seeking Illinois trucking, whether it’s in-state or interstate. We have a unique and fully automated Freight Quote System that’s both fast and easy to use. It can estimate your costs for a full truckload, less than a truckload or international shipping. Give it a try now, or read about the issues that affect trucking in Illinois. Several major highways crisscross Illinois, befitting its central location within the United States. 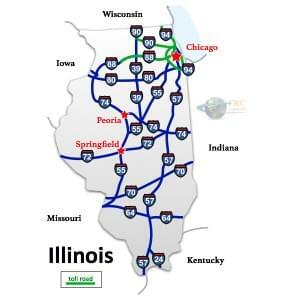 Its major north-south interstate highways, I-55, I-57 and I-90, directly connect Chicago to St. Louis, Missouri, northern Kentucky, and Beloit, Wisconsin respectively. Its major east-west routes are I-80 and I-88, crossing Illinois from Iowa, through Chicago and into Indiana. I-64 does not cross through any major cities in Illinois, but it is a major trade route, connecting Richmond, Virginia to St. Louis. While Illinois’s weather is usually manageable, winters remain well below freezing for months on end, making black ice a real threat. Severe thunderstorms are fairly common during the summer, especially in the areas closest to Lake Michigan. Though it was once the seat of America’s steel and railroad industries, Chicago’s—and by extension, Illinois’s—economy now centers on pharmaceuticals, food, finance and medical services. Because of its central location, Chicago remains a major distribution hub by means of highway, rail and even shipping, through the Port of Chicago. Outside of Chicago, agriculture and farm machinery manufacturing make up most of Illinois’s economy. Illinois also exports food across the country and beyond. In 2013, Illinois exports totaled $65.8 billion, making it both the fifth largest exporter and overall economy in the United States and the largest in the Midwest. Chicagoland is home to countless successful companies, including Kraft Foods, Boeing, Sears, Abbott Laboratories and John Deere. 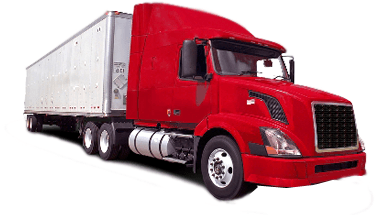 A wide variety of different Shipping Services are available to serve the state’s industries. Heavy machinery and large vehicles made in Illinois service countless industries in all 50 states, but much of that machinery is destined for the oil, energy and chemical industries. As a result, lots of shipping in Illinois goes to and from major energy and petrochemical producing states like Texas, California, Georgia, Washington and Arizona. Besides Illinois’s own products, the immense volume of goods traveling through the Port of Chicago, into the rail distribution network, or simply traveling through Illinois between Iowa and Indiana make Illinois one of the busiest shipping states. Chicago is also a major tourist destination. Consequently, Illinois’s roads tend to be high-traffic, especially around Chicago. FRC receives many requests for Illinois trucking and Illinois freight services to and from California, Texas, Arizona, Washington, Georgia, and Washington State.